PHILIPPINE SOCIETY has been mired in crisis for centuries due to the rapaciousness and incompetence of a ruling elite nurtured by colonial rule and sustained by imperialist intervention. The signs and expressions of that crisis – poverty, injustice, political instability, violence, uncertainty and fear for the future – have, as a consequence, defined what is “normal” in the lives of millions. Six months after Rodrigo Duterte assumed the presidency, as in many times past – most outstandingly during martial law (1972-1986) and the Gloria Macapagal- Arroyo regime (2001-2010) – the Philippines is once again caught in a human rights crisis that’s threatening to morph into a major political upheaval. The next few months of 2017 will tell if, in an attempt to resolve a crisis that’s fundamentally its own making, the Duterte administration will push it to even more dangerous levels, plunging the country into a maelstrom of violence only a radical shift in political power can remedy, or if it will continue to hobble along while further savaging the Bill of Rights until the end of its term. Since the overthrow of the Marcos terror regime in 1986, the Filipino majority – workers, peasants, and petty traders, as well as middle and lower level professionals – have tried to resolve the crisis through the ballot. Disaffection with the political system and governance, partly because of the unfulfilled promises of EDSA 1986, has led them to elect the untried, the incompetent and the plainly clueless – among them actors and comedians – to public office in their futile search for solutions via the electoral system to the uncertainties of daily existence. They have invariably been disappointed. But although unarticulated by the 16 million Filipinos who elected him, Rodrigo Duterte’s rise to the presidency was part of the same process: the majority’s search for the messiah who, once in power, would bring about the society of justice, peace and prosperity that has eluded the Filipino people for centuries. As popular as he still is, Rodrigo Duterte is this early threatening to be as disappointing as such mass experiments with seeming political mavericks and outsiders as Joseph Estrada. His pre-election promises on a wide range of issues – from corruption and the drug problem to foreign relations and peace talks with the National Democratic Front of the Philippines (NDFP) as well as the release of political prisoners – did resonate among a people who may not have articulated it in coherent terms, but who, as the Left has long argued, are hungry for change and even revolution. But most of these promises have remained unfulfilled, while Duterte’s preferred approach to the drug problem has led to an unprecedented level of killings mostly by a police force he has empowered as judge, jury and executioner. In the process, this policy is not only undermining the Bill of Rights including the presumption of innocence, but even worse, also creating a climate of fear and enshrining the use of State violence against the poor as the only means of addressing the country’s problems. The resulting crisis in human rights and the rule of law is turning into the likely justification for what the Duterte regime itself has warned is an impending attempt to oust it via a coup d’etat by a combination of forces hostile to any accommodation with the Left. These include an officer corps in the military thoroughly ideologized in the primacy of defending elite and US interests, as well as those other forces that exaggerate the influence of the Left on the regime and which therefore fear that that influence will lead to the authentic political and economic reforms that they think will likely compromise their landed and corporate interests their monopoly over political power has long enhanced and protected. These circumstances have thrust upon the alternative media the responsibility of providing the Filipino people not only the information but also the analysis and explanation necessary for them to understand the present crisis, and what is even more important, to take the steps necessary to help prevent, and – if it should come to that – to adequately respond to, the present crisis’ deteriorating into the restoration of an openly authoritarian regime. The latter can occur through a successful right-wing coup – or through the Duterte regime’s suspending the privilege of the writ of habeas corpus or even declaring martial law. The latter are options Duterte has publicly proposed as supposed means of addressing the drug problem, but which can very well be used to suppress not only attempts to overthrow it but also such rights as those of dissent and criticism. 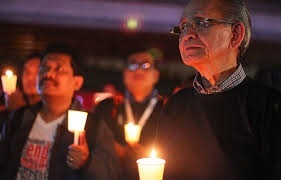 To help prevent such a return to dictatorship, whether through a coup or through the Duterte regime’s attempt to preempt its overthrow, the alternative media must closely follow and provide appropriate and timely analyses of political developments in the coming months so the people may be forewarned of the threat to their rights. But there is opportunity as well in the reemergence of the threat of an authoritarian restoration. It has enabled the alternative media to even more fully function as an instrument in educating the people on the folly of relying on the electoral system as a means of transforming society and, together with the mass movement, on the need to broaden their awareness of, and commitment to, the imperative of democratizing political power as the only path to authentic development. The Duterte regime has generated a crisis that can very well lead the centuries old crisis of Philippine society to another acute stage. But it has also provided the people’s movement an opportunity to seize the initiative in the struggle for national democratic change. This is an opportunity to which the alternative media can contribute through the kind of reporting and analysis that even in the worst times of times have served the people well.